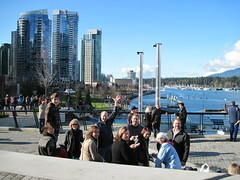 I hope that it is OK to celebrate George Washington's birthday in George Vancouver's city. Instead of our annual Big White ski vacation, this year we did a Dutchman's Olympics day. In addition to celebrating Bjorn's birthday, we watched a lot of the Olympics and went to Vancouver one day to take in some of the free sights. We spent a long day in the city doing the tourist thing. Leaving Lynden in a downpour, we expected the worst in weather; but were blessed with sunny skies. It was quite a challenge to keep 15 people moving in the same direction and not losing each other in the crowds. We spent much of the evening watching the big screen at David Laim Park. We felt a little out of place cheering the USA on in the midst of a Canadian crowd. At 11:30 at night the line at the The Hudson Bay Olympic store was short enough for us to do some souvenir shopping before catching the skytrain back to Surrey. Some of the group also went to Abbotsford on Saturday to watch Russian figure skating practice. It was nice to be close to all the action, though the event coverage is a lot better on a couch at home than the streets of Vancouver.